The last big innovations in drip coffee machines were showerhead-style water distribution and attempts at SCA-approved temperature consistency, and those happened in 2012. While factors like build quality have improved since then, companies like Bonavita and Technivorm are essentially making the same machines they did 5+ years ago. We know by now you can’t leave a space sans innovation for too long, or Breville is going to step in. The Breville Precision Brewer Thermal includes all the interface and aesthetic improvements, and amazing build quality that come standard with Breville, along with the features we outlined above that define premium coffeemakers post-2012. But wait, there’s more. The Thermal generously includes a gold tone flat bottom filter, as well as paper filters right in the box, and brews a whopping maximum of 60 oz of coffee if you’re doing drip. That “if” is where things get interesting. The Thermal, in addition to the SCA-appoved “Gold” mode, and “fast” and single-cup modes, also has the brains to brew over ice, brew cold brew, and even do your pour over for you. The iced coffee and cold brew modes, as you can imagine, simply adjust the settings, temperature, and time to account for the process, while the pour over option lets you pull out the thermal carafe and brew directly in to your Kalita Wave, etc. Even better, all aspects of all these modes are customizable. A minor annoyance is that you have to order the pour over adapter separately, though it is free with purchase of the Thermal. Another issue that’s not exclusive to Breville is a lack of accompanying recommendations around grind size. With so many brew modes, a detailed “start here” grind size chart would be very welcome. 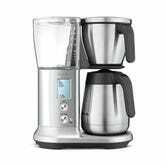 We’ve seen our most recent coffeemaker recommendation, the OXO On, fall to $120 over on Kinja Deals, and our current favorite cold brewer, also from OXO, drop to $39. That still leaves a pretty big price delta between those products and the Breville Thermal, though we all know once the Thermal hits Amazon that MSRP won’t last long. There are other considerations as well, like the fact that the OXO makes more concentrated cold brew, in larger volumes, so to some degree your coffee consumption habits should dictate your course here. That all said, the Breville Precision Brewer Thermal is the only drip machine we’d buy at this point. The coffee, yield, build quality, looks, and interface are best-in-class, and no other machine offers this much versatility.